A World War Two seaplane has been left abandoned and stranded for a while on a beach off the north Gulf Coast of the US. It the subsequent “recovery operation” the Catalina broke apart and has been destroyed. 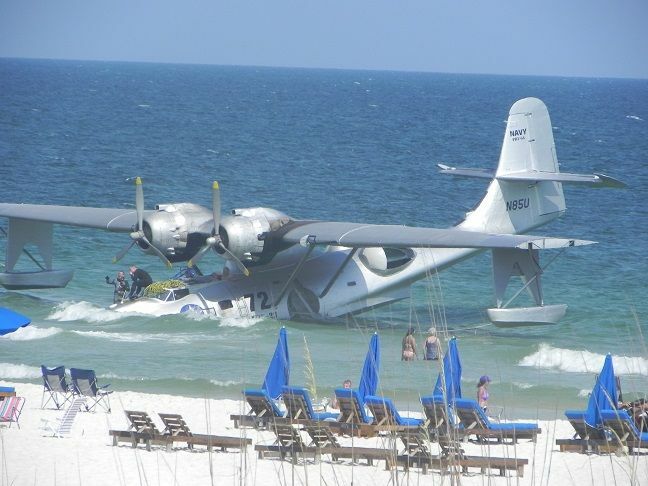 The plane is a PBY-6A seaplane that was built and used during the war. The plane was being used in a new Hollywood movie starring Nicholas Cage, but during filming a minor flying complication occurred and the pilot had to do an emergency landing off the Florida shore line. 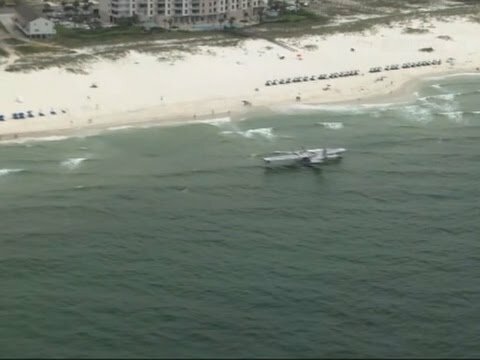 The plane landed close to the shore near the Alabama and Florida state border, and close enough to the beach that swimmers and surfers can take a look at the aircraft. The plane was anchored to the shallow shore but has become flooded with water. You can see some video of the airplane as salvage crews “attempted to save it” in the link below that was shot by local news station Fox 10. The aircraft was apparently restored specifically for the upcoming Nicholas Cage movie USS Indianapolis: Men of Honor. 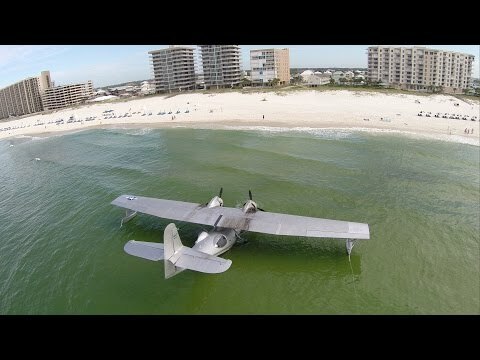 The PBY-6A is a twin engine seaplane built in 1945 and was being used to film a new movie about the war time disaster aboard the US Navy’s USS Indianapolis. The USS Indianapolis was a Portland heavy cruiser and was named after the US city of Indianapolis in Indiana. She served in the Pacific during World War Two leading the US Navy’s Fifth Fleet. The ship had served throughout the US involvement in the Pacific. It was July 1945 and the war in Europe was at an end, after Hitler committed suicide at the end of April that year and German army commanders signed the official surrender to Allied forces. But over in the Pacific the Japanese held on to their positions and continued to fight the US troops. As the USS Indianapolis made its way back to base, a Japanese Navy submarine, an I-58, located it and fired a torpedo that would sink the ship within just 15 minutes. Around a third of the almost 1200 crew went down with the ship. The remaining crew were stranded in the vicious waters of the Pacific, The Telegraph reports. The disaster was only discovered by US authorities four days after the incident and so most of the crew perished. Only around 320 crew survived.